Information provided by Laurie P, a NELSAP regular who taught(1991-2001) and was a patroller(1990-2001) and Patrol Director (2003-2006) at Pine Ridge. 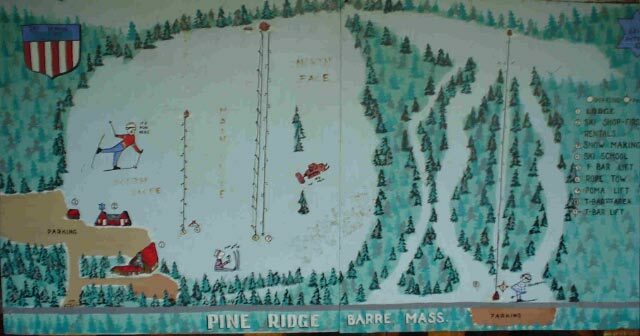 Pine Ridge opened in the mid 1950's under the name Barre Ski Tow. 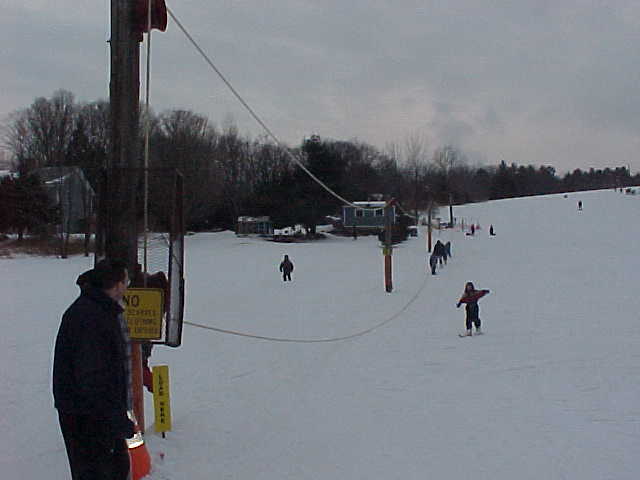 It was a small rope tow area much like many of the others that popped up in central MA at that time. 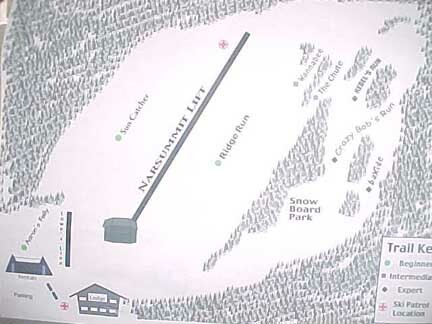 Looking at the Map on the right, the original rope extended from the stand of trees to the left of the bottom of the Snowboard Park ending at the stand of trees to the left of the Wannabee Chute. The area was open 7 days a week. 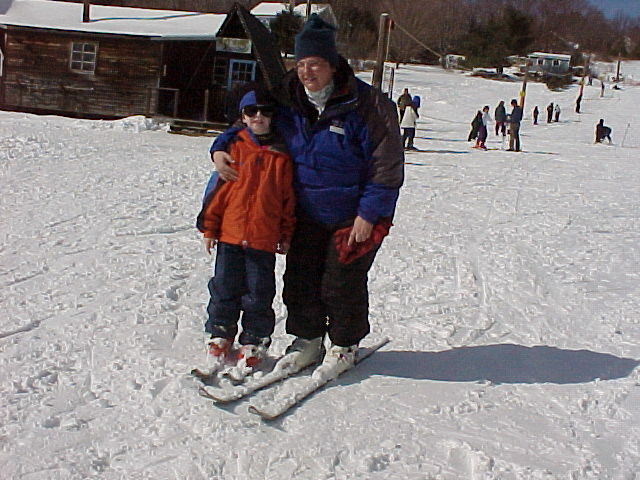 Many pair of leather gloves were spent on that rope tow. As I remember from my experience in the 1960's. the rope was made of a heavy hemp that got heavier when it got wet. It was a fairly steep tow and falling off was common. 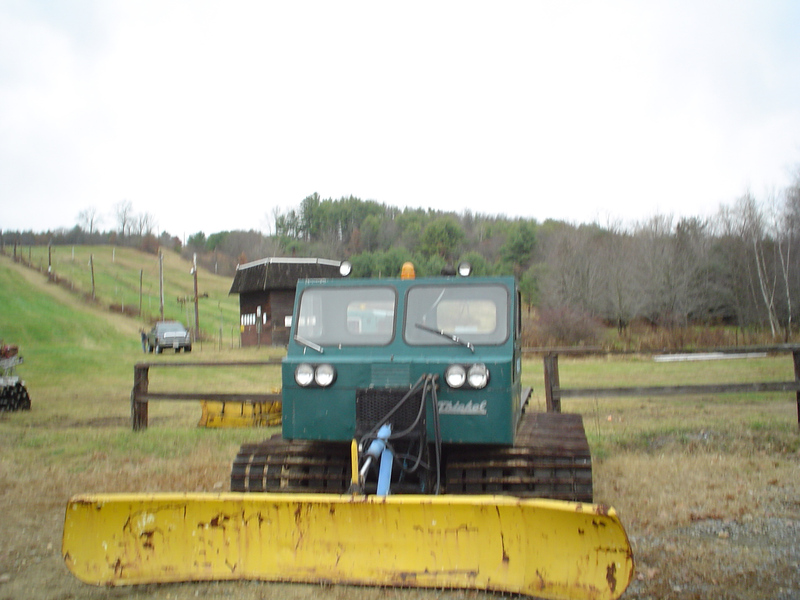 In the mid to late 60's a t-bar replaced the rope tow. 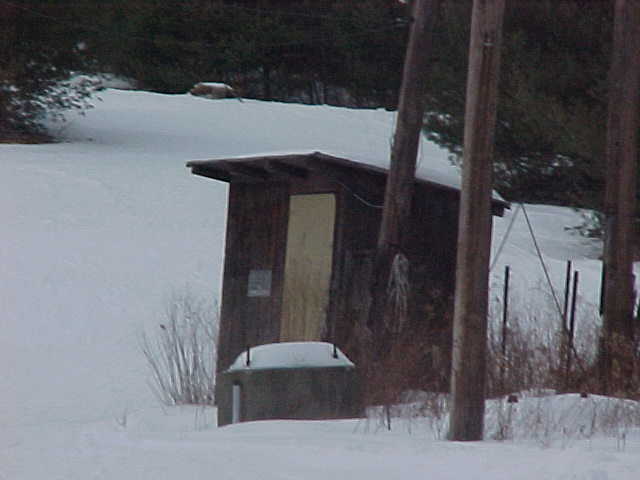 This increased the vertical drop of the area to 224 ft. Night skiing was added during this period . 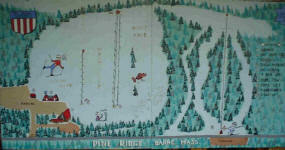 It was about this time that the area became known as Pine Ridge Ski Area. 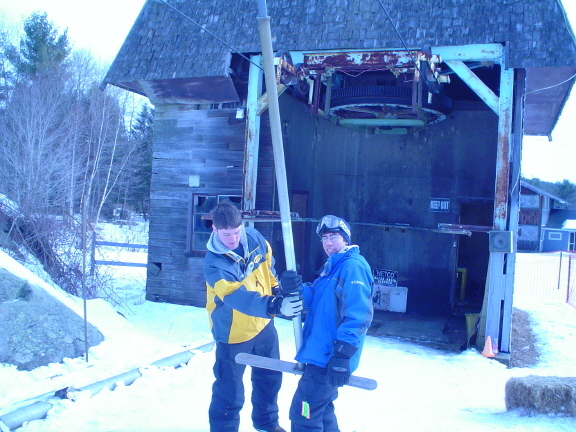 The Mueller T-bar ran from a location about 15-20 feet below the bottom of the old rope tow, up "The Chute" and terminated about 150 feet past the end of the old rope tow. 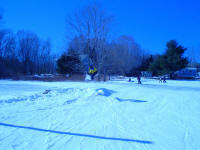 It was quite popular with the skiers. In the early 70's a second T-bar (A Hall, the Narsummit Lift in the map to the right) was installed. Both T-bars ran to the late 70's. In the late 70's there was talk, and plans to relocate the main portion of area down the road about 1/2 mile (across from the current Ace Hardware) and build a link to the currently operating area. This is pictured in a map below. This would have made the area larger than the currently operating Nashoba Valley. In preparation for this expansion, the Zoomer Double from Cannon Mt. was purchased and stored in the lower parking lot. The area was thriving from the late 60's to the late 70's. There was an annual Winter Carnival. A Torch Light Parade, Miss Pine Ridge Contest, races and other events were held. I actually won a silver medal in a Bonne Bell race held at one of the carnivals. Here is a terraserver image of the area. 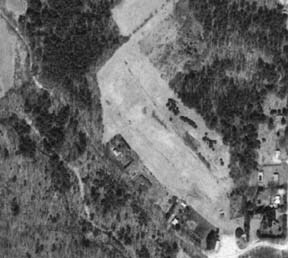 Plans for the expansion were thwarted when the board of selectmen would not approve rerouting of the road that passed through the middle of the planned base area of the new area. A few years later this road was taken over by the state and named Route 32. The chair sat idle in the parking lot for a couple more years, but there was talk of installing it to replace the Mueller T-bar. In 1982, the owner of the area became ill and was unable to put he time and money into the area to run it as he wanted to. The area closed and remained closed for about 8 years before the O'Connor family took it over in 1990. They ran it for about 2 years while the former owner (Bob Anderson) had possession of it, buying it from him just prior to his death. 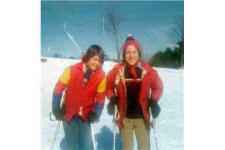 The O'Connors had three sons that learned to ski and snowboard at the area and helped out in the daily operations. 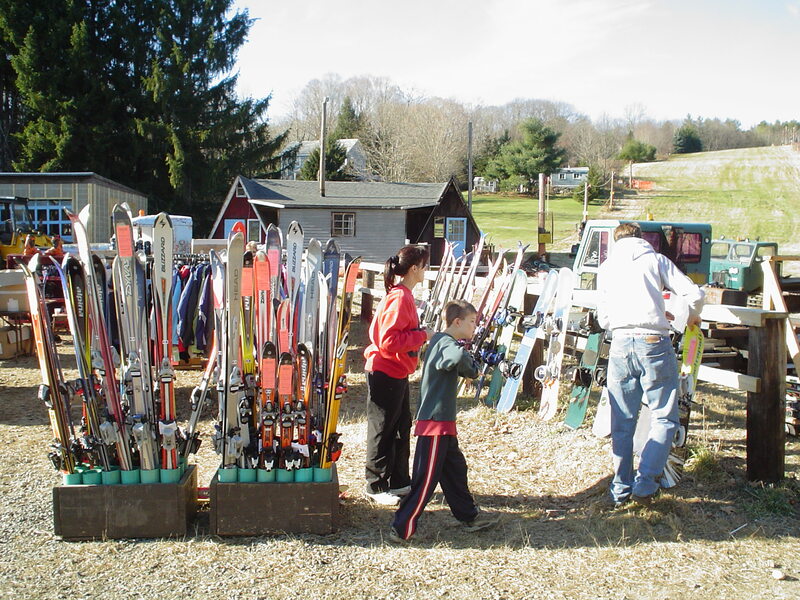 During the time they owned and operated the area the Mueller T-bar was removed and sold to Ski Ward for snowmaking and grooming machinery. 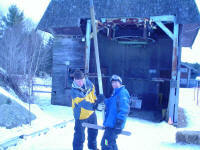 This dropped the skiable vertical to 200 Ft. A small, separate snowboard area was added and several trails were cut. Rental equipment and lessons were available. Most of the rental equipment was old but it was maintained and checked yearly. Its lodge was one of the few that sold home made refreshments including chowder and chili at reasonable prices. It had a lounge for after ski enjoyment (occasionally there was entertainment). Its ticket prices were very reasonable. A family of 4 could ski (with rentals and lessons) for what it would cost for 2 to ski at nearby Mt. Wachusett. There were about 15-20 ski and snowboard instructors and snowmaking. The area was open From Wednesday through Sunday at night, weekend days and on holidays. It was located on South Barre Rd. ( old route 32) in Barre, about a half hour from Worcester. Little happened to modernize and improve the area while the O'Connors operated it. They did upgrade about half of the rental equipment and completed necessary maintenance on the lift and facilities, however. As the O'Connor's three sons got older and lost interest in the small family area in favor of nearby larger areas, the parents lost interest in running it. Pine Ridge closed in 2001. The family sold off rental equipment they had purchased and the contents of the Ski Shop they had opened in the center of town. The lounge as it appeared in 2001 is pictured below. In 2002 a local developer bought the area. Community members who grew up skiing the area (as he had) feared the worst and approached him asking that he not develop it but rather re-open the ski area. 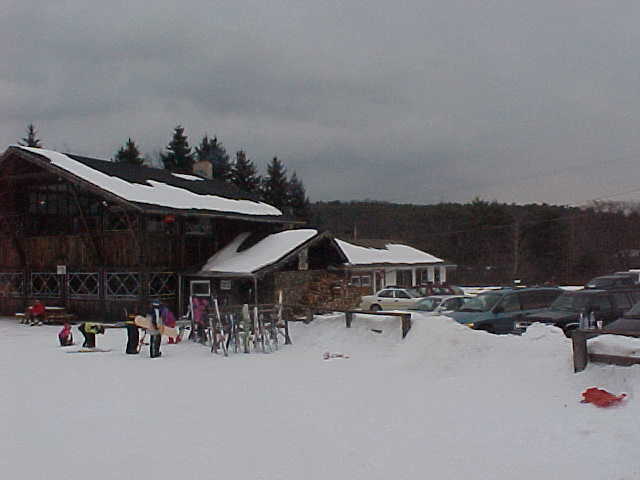 The following year it was announced that the ski area would once again open. 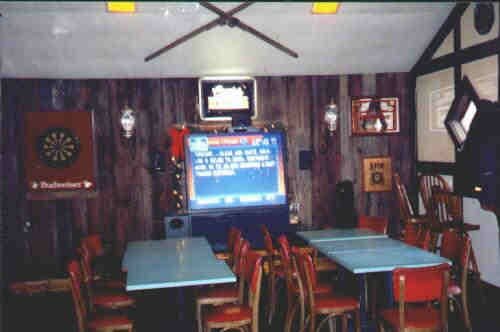 Major renovations were completed on the lodge including converting the old, worn down lounge into a state of the art sports bar complete with food and flat screen TV. Rental equipment was upgraded and replaced and the entire area got a fresh coat of paint (except the Hall T-Bar, which was in desperate need of it). 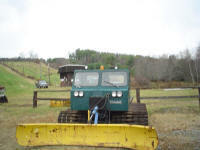 New snowmaking equipment was purchased and things looked hopeful for the area. In fact, for the first two seasons they were. Chronicle came out and did a piece on the area. It was broadcast throughout the state and many skiers came out to check out the area. Upgrades and improvements were evident everywhere. Unfortunately, the only real upgrades to the lift was burial of the electrical and communication wires. 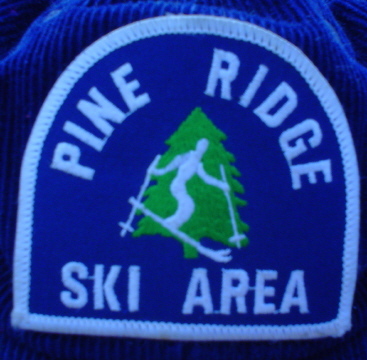 Despite being renamed Pine Ridge Snow Park, there was no evidence of a snow park. 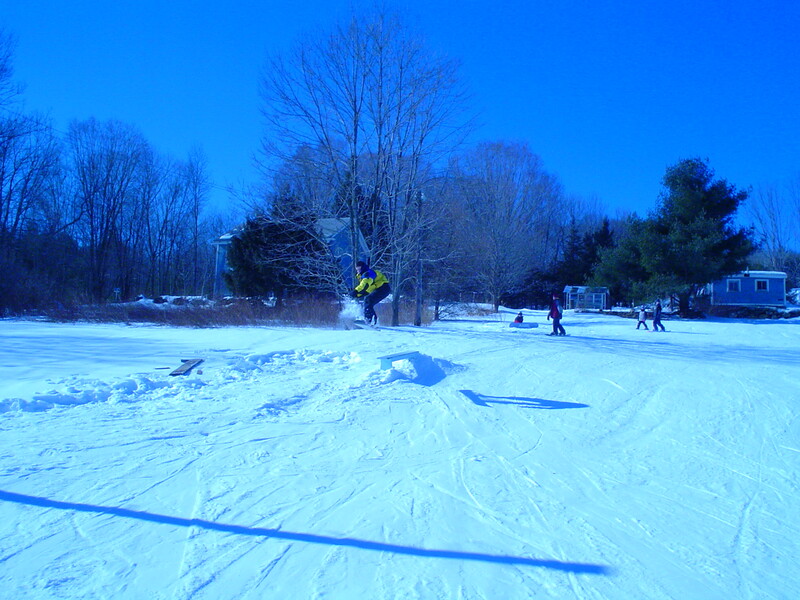 The snowboard park was removed and plans for tubing were scrapped. The lift was plagued with problems. Several T-bars were flagged off because they were broken and not repaired, the lift stalled out and was difficult to start on some occasions and the cable occasionally jumped the line, all problems inherited from the previous owner. As one thing was repaired another would surface. 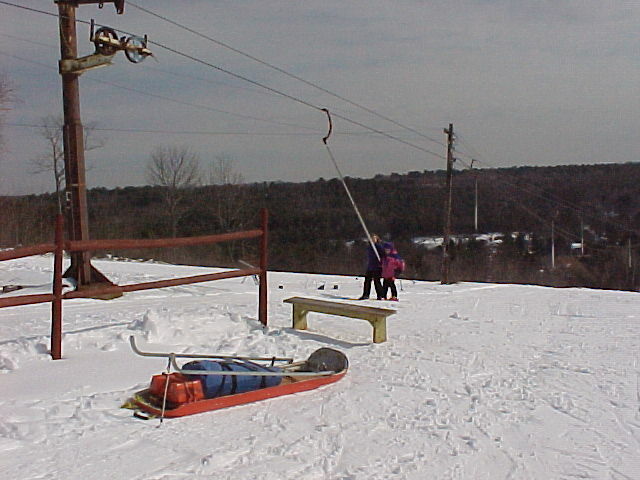 The owner talked about installing a chairlift and even went to look at some, but decided they were too expensive. 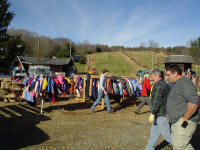 Despite these difficulties it was able to attract some school groups and families from the area. To supplement the operations at the ski area, snowmobile hill climbs were added a couple times a year. They drew a large crowd to the area. Fire strikes the rental building! 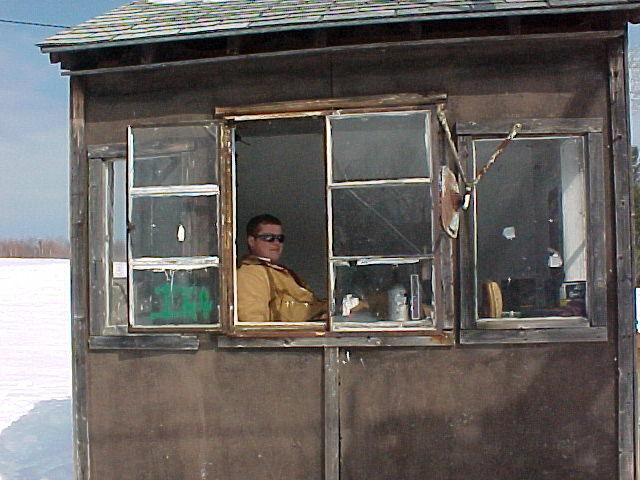 In the early morning hours of August 21,2004 the fire struck the Ski Rental Shop at the Pine Ridge Snow Park. A line of severe thunderstorms that had passed through the area is the suspected cause of this blaze. The fire was discovered in the ski rental building at around 4:30 AM. Town employees traveling between South Street and South Barre Road via Stetson Road spotted the fire and called it in to dispatch. Firefighters returning from another storm related call arrived at Pine Ridge within moments. The firefighters, aided by the heavy rain, were able to quickly contain the blaze that heavily damaged the fitting area of the rental shop. 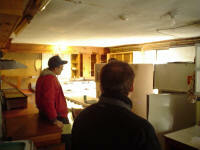 Skis, boots and snowboards sustained smoke and water damage. The actual extent of damage has not been determined at this time. It appears as if the building may have sustained some structural damage, however. Pine Ridge goes out with a BANG! 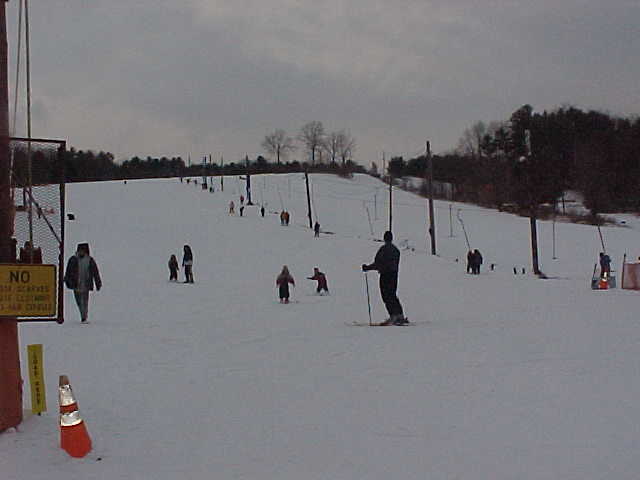 Pine Ridge Snow Park had a very rough 2005- 2006 season. Everytime they would make snow there would be a weather event that would take it away. The area did not get opened much before the February school vacation week. It was a frustrating time. When the area finally got opened the skiing was fantastic. 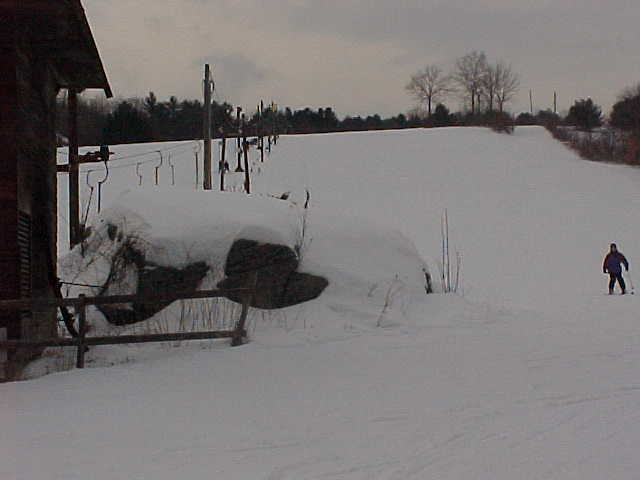 The hill was completely covered and in good shape on March 4th. A Snowmobile event had been planned for the next day which required jumps, so as skiers skied on one side (main slope), snow was being trucked in and a jump being made on the other. Since there was so much snow there was talk of the jump being knocked down and the area opening for skiing the following weekend. According to Laurie P. "Around 2 p.m., when I was standing near the rope watching the hill and jump construction, I heard a huge "BANG" and turned toward the group working on the jump to see if it came from there. It had not. As I looked toward the T-Bar I saw a flame jumping out of the end of the exhaust pipe, then there was another, louder "BANG" and the flame jumped about 6 ft high and appeared to be coming out of the roof of the lift house too. The lift was still running, the operators standing outside of the house with the return wheel and the motor. I called to them and told them to shut down, they had a fire. 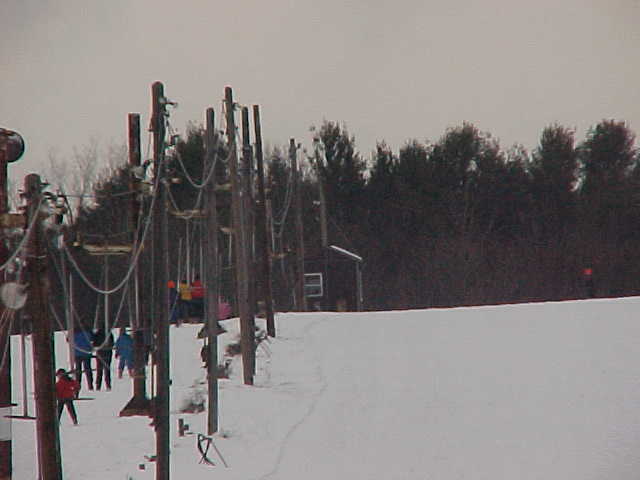 The lift was shut down and evacuated and the ropetow area was shut as a precaution. (we didn't know what caused the fire and if it was going to blow). The fire department was called while the area was being cleared. After the lift was stopped with the emergency switch at the top of the lift, the flames continued for a few minutes and then went out. The fire department arrived and inspected the building and the motor. The lift could not be opened again and would most likely need to be replaced. RIP Hall T-bar." Laurie P. About 35 years ago a young boy (4th grade) stopped at the little house at the top of the hill to say hi to the people living there (friends of his parents). While he was in the house the lifts shut down and the lights went out on the slope. Seeing that he quickly left and started down the hill. He thought it safe to ski down because the Sno-Cat was on the other slope. About 3/4 of the way down, on a bend in the slope, with the view obscured by a grey building belonging to the house next door, he was hit by a Tucker Sno-Cat (they were running 2 that night). The boy survived, and after a long recovery, had you not known about the accident you would never have believed it. He was out skiing the next season. He was one of my good friends at the time, I remember it well. We had lost another close friend the year before in a snowmobile accident. I remember the terrible feeling when my older brother, who worked at the area, came home and said that David got hit by the sno-cat and it didn't look very good. I knew him well all through High School and until his untimely death in 2006. He is pictured below with another friend Liz. Click on each picture for the larger version. Tbar and lights for night skiing, top lift building. Patrol Toboggan at the top. Lodge and Parking lot, First aid room is attached to the lodge in the wing near the white car and red wagon. There is an apartment to the right of the patrol room. Renovations to the lodge underway. Central staircase removed and relocated. Planning for the new, modern kitchen.